There are many popular methods for promoting the farm involved in selling products direct to customers. This article is for both those just starting their exploration of farm promotion, and those seasoned but looking for gaps in their system. When choosing promotional techniques, consider that you’ll most likely be attracting new customers as well as keeping past ones loyal and interested in your farm. Many promotional techniques will generate both types of customers, while some are more appropriate for one than the other. Know which type of customers you’re looking for. Do you actually have a waiting list for your CSA, and prefer to concentrate on keeping the good customers you have? Are past customers moving from your area with few prospects for new ones to fill in? To generate new customers, you've seen businesses with company cars promoting their businesses everywhere they drive. They know this works. And on a smaller scale, you’ve seen bumperstickers promoting businesses, points of view and travel destinations. Make a bumpersticker for your own vehicle. That's the simplest phase of bumpersticker farm marketing. The second phase is making several bumperstickers, and getting them on the cars of friends and relatives. Giving them away (vs. selling) will produce more promotion with words like “I shop at Grapehill Farm, www.Grapehillfarm.com”. Selling them is best for the agritourism farm where guests want to show off their travels -- "I’ve Fed Sheep on Grapehill Farm, Ashland, Oregon." Numerous successful farms that cater to the local community insist articles in local papers do more to draw quality customers than any advertisement one could possibly pay for. They also make current loyal customers proud to have already discovered you. My own experience with this is that when they spell your name wrong, don’t quite quote you correctly, and mistake goslings for ducklings, it still works! People love to witness what the media has reported. The photograph above is the creation of Carol Ann Miner of Anacortes, Washington. Whimsical farm and garden displays can capture the attention of the media. You may be discovered by them just by passersby taking note of what's happening on your farm. But the best way is often by sending out press releases to your local newspapers, TV station and radio station. This alerts the media to your existence. Even farms trying to reach a more distant audience can benefit from local media attention because little mentions can lead to larger ones. Destination farms have found themselves listed in European travel guides with no idea how they were initially discovered, but now happily book numerous Europeans and find themselves filled through August by January or February. Larger publications scan the smaller ones for interesting news and prospects to flesh out their lists. The Farm’s open house can be as simple as a table of stacked ears of corn next to a pot of boiling water for a corn tasting event. The event itself, of course, will need promotion to attract visitors, but once the event occurs, it may end up being the most valuable promotional tool of all. For one-time or seasonal events, some farmers have benefited from printing up fliers to be displayed in the towns where their customers live. The owners of Sweet Grass Dairy in Thomasville, Georgia USA hold two open houses in spring and fall called Market Day that attract many visitors to their grass-fed dairy. Co-owner Jessica Little stated that one of their methods for drawing customers includes having their local printer create posters announcing the event, which they put up around town before Market Day. If interested in trying out fliers or larger posters, get to know all the locations near you that allow quality fliers or posters to be displayed, and think about having a graphic design inclined friend design it for you, making sure the basics below are covered. I’ve seen fliers that hark of a fantastic event…. with no address listed and no contact information for finding out where it was! A short catch phrase in large, bold, easy-to-read letters (don’t get wispy or flowery with the lettering here). You should be able to read it 10 to 15 feet away. In smaller lettering, list all other relevant information: date, time, fees, location, contact for more information. Use very few words for this list. Your audience is passersby, who may keep on walking if they see too many words. This list would be the most effective and attractive to the eye if it were bulleted. An attractive image of the farm, of flowers, of pumpkins. This can be almost as important, if not more so, than the catch phrase. It also should be visible from a distance. Have a good speller who didn’t design it do a final proofreading. Usually, putting it up two weeks before the event is ideal. One week may not give people enough time to plan. Remove them when the event is over if you want those kind enough to let you use their space for free advertising to let you put them up again in the future. Printed brochures are giving way to online promotion as a tree-friendly and more valuable form of ongoing marketing. But many still like to carry business cards, and you may choose to overlap and use both brochures plus business cards along with online marketing, making sure your website is on your brochure and business cards. The brochure tends to be adequate for describing the farm year-round, where as the flier is for a one-time situation. A permanent brochure location example could be your local Chamber of Commerce (check for their size and other requirements); while an example of brochures’ occasional use would be an off-farm community event you take part in, such as a community festival where you sell farmed products at a booth. The basic need is a farm website that’s kept fresh and up to date. Added elements can include the online farm journal via a weblog which helps retain current customers (see below), and various methods for helping potential new customers discover your website. For starters, get the website up. Some farms have traded web services for CSA shares, and a savvy computer person can find ways to trade links with other quality websites, and other ways to lead new customers to your farm’s site. A farm sign can alert people to your location, create a gateway between the farming and non-farming world, and draw the attention and curiosity of passersby. Farms are often private homes, and visitors can feel they are welcomed rather than intruding when a sign officially announces the farm. If you give the occasional, casual farm tour, an A-frame or otherwise portable sign may suit your needs. If drawing the attention of the general public is inadvisable for your privacy and safety, you may choose to forgo an official permanent farm sign. 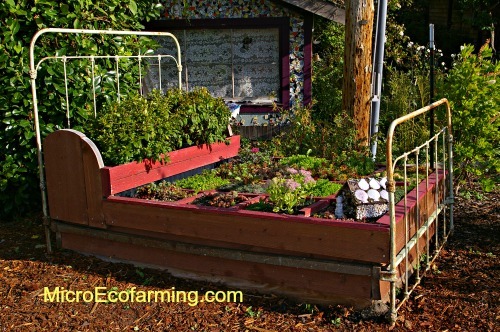 But curb appeal can be added instead of, and certainly in addition to, a permanent farm sign. In improving curb appeal, you’ll want to maintain being true to yourself, after all, you’re a farm owner, not a theme park. But perhaps tweaking your farm’s first impression somewhat, such as deciding that the trash really could be moved to a better location than your front yard, won’t make the farm any less functional. We get used to our own surroundings and don’t get offended when we’re shoving last night’s dinner dishes to the side to make space on the table. But for curb appeal, try to sort out what visible aspects are actually successful farming operation: neatly stacked buckets, farm wagons; and what is residual work and trash we all wish would go away but never does: piles of junk mail not sorted yet, tossed buckets instead of stacked ones you swear you’ll get to tomorrow, and the trash itself. Consider keeping the latter out of view. It can be profitable to network with larger entities created to help promote ecotourism. It can also be dangerous, or at least, a waste of money. “Larger entities” include citizen groups specifically formed to promote and support local farms, local Chambers of Commerce, agriculture extension groups, shared interest groups such as sustainable living organizations, and businesses set up to lead tourists to attractions by geographical area. Networking entities may also include those with which you create packages with other businesses such as hotels. Or, it could mean looking into all other events that already happen in your area, and joining them, allowing your farm to be a segment of those events, such as being a stop-off point for an annual bicycling event. As far as tourist promotional groups and listing directories, these may charge a fee to list you, or may want a percentage of your revenue, depending on your country and theirs. A main thing to watch out for is whether the entity really wants to make their relationship with you mutually beneficial, or simply wants to take a possibly too large percentage off the top of the fees you charge guests without doing much authentic promotion beyond a quick directory listing. You, then, are still stuck doing most of the promotion while they take their slice. 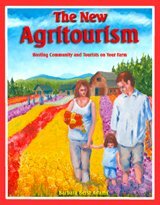 In some other countries, there is the problem of local farms being promoted as tourist attractions by large tourist entities, without any method for the farmers themselves to receive added revenue. Also, be aware of restrictions that are too high for you to meet. Bed and breakfast promotional organizations, for example, understandably need to make sure the B&Bs they endorse are safe and that the B&B is operated legally, in order to maintain their own reputations, which in turn, allows them to stay successfully in business. But their restrictions may be too stiff for your perfectly legal and enjoyable B&B farmstay. If they require private bathrooms and you offer a rustic outhouse, you may find that marketing independently will serve you better. You may also want to look into the AirB&B project. It has grown tremendously in the last several years. The farm journal can be in the form of a monthly print newsletter, an online weblog or e-newsletter, or a combination. Both men and women farmers of the past used to keep journals and logs, it’s a natural part of farming for many. If journaling is for you, consider using a version that’s appropriate for others to read as a marketing tool. It’s the realness, and the uniqueness, of who you are that cannot be duplicated by theme parks, slick ads, and cannot be mirrored and offered for less by a competitor. No one can describe the first crops that push up from your soil, complain about the unexpected hail storm, share excitement about the new peach variety, the way you can. Let your guests live vicariously through you. A farm journal can both maintain current customer loyalty and attract new customers when its print version is passed around, or if it’s an online version that can be found by web surfers. There are books, trade magazines, in fact entire university degrees catering to the benefits, pitfalls and skills needed to make paid advertising in print, radio, online and TV media effective. We won’t elaborate too much for this article. But do know that the reason news articles, for example, have more draw to customers than paid advertising is their believability and trust. The media is supposed to give unbiased reports and is therefore more trusted by the public. Ads, most people know, are meant to say only the good things, and leave out the rest. People don’t trust paid ads as much as they do other forms of communication such as news articles or going in person to the farm. However, a classy paid advertisement can sometimes pay off. There are two basic types in print. The ads that take up space, say four inches by four inches on a newspaper page, or the full back page of a magazine, are often called space ads. The other choice, as most know about, is the classified ads. If you are trying to draw customers of a certain location or shared interest group on an ongoing basis, and you have a reputable publication that reaches this audience, a simple repeated space ad may help keep your farm’s name in the public eye. If you’re having a one-time farm event, and you feel that it may appeal to those who love to cruise classified ads (bargain hunters or those seeking special events), a classified ad may be well worth its cost. But if you plan to get deep into paid advertising, I strongly suggest you learn more about how to target such ads, and how to keep track of their effectiveness over time. Also, learn to talk shop with fast-talking advertising salespeople. For example, newspapers can put your ads in the least desirable location. Ask what your options are as far as where your ad will be placed, and if you have no control over where it’s put, and there’s a chance it will be stuck in a rarely read location, or a location that doesn’t draw the type of reader who would be interested in your farm, you may want to tell the salesperson you’d rather do other forms of promotion than risk purchasing space from his or her newspaper. As another example, if a reporter is doing an article related to your farm’s theme, perhaps even an article on your farm itself, you may be suddenly approached by the paper’s sales staff, with stiff deadlines, to put an ad in at the same time the article will appear. Consider this very carefully. In what way would a paid advertisement benefit the promotion you’ll already receive from the article? Would it actually look better for you to be presented only in article format? Would your advertising budget do better to allow the article to promote you for free, with, perhaps, a follow-up ad in the next edition? If you feel you’d rather not purchase an ad on top of the news already being presented about you, you may want to tell the salesperson that your advertising budget has already been allocated for the year, and if the article about you appears to attract a good enough audience, you’ll consider them in your budget next year after carefully, without pressure, assessing their information regarding readership numbers, advertising prices, and choices for ad location. Customer feedback should do two things to boost your business. It should tell in what way you’ve made your customers happy, so you know what to continue. Or, it should tell you where you really screwed up. The six-foot tall gory monster that chased the preschoolers out the door in the haunted barn was just plain stupid. Use the negative feedback to tweak your product (that makes you smart again… unless you were actually illegal or harmfully negligent), or find a different audience (such as teenagers who love to be scared by six-foot gory monsters). The positive feelings of your farm customers will also work for you in the promotional department by generating some of the best promotion money can’t buy: word-of-mouth. Further, you can use the positive feedback another way for marketing: Build a reliable group of satisfied farm visitors for references or testimonials. This foundation is the leverage many small businesses can use to great advantage. In fact, it can be used even before you’ve decided exactly what your direct marketing venture will be. New business owners sometimes use a strategy where they contact potential customers even before any product is created. For farmers in the planning stage or those looking to add new crops or value-added products, this strategy might be worth considering. A list of possible customers is drawn up. A detailed description of the potential product or service is written up, and then it’s sent out to the possible customers for their feedback. The reasoning is that most of these hypothetical “customers” will give both positive and negative feedback. With the negative feedback, the product is tweaked and streamlined, and the description or prototype is sent out again until a desirable “can’t miss” product or service is developed. After this, a few of the products are given away as a practice run to the most eager customers who receive it in trade for giving testimonials and references. This allows the new business to avoid wasting money on a product that no one wanted in the first place, and to start out with a group of already very satisfied customers. They start with a proven product with satisfied customers to push them off towards success. This has worked for new agritourism ventures when the farms already had a list of potential customers, such as CSA members, and the on-farm project, such as an annual pumpkin patch, is in the planning stage. It can be very valuable to hear: “Actually, there’s already too many corn mazes around here. How about a labyrinth instead?” Or, “I’m using your farm to expose my kids to something besides a world of constant comparing and competition. Could there be a ‘pumpkin carving demonstration and gallery’ showcasing the kids’ pumpkins, instead of the usual pumpkin carving contest with only one winner?” Then, if you choose to eventually test out an event or other on-farm marketing idea by first just giving it away when you plan to eventually charge for it, test it on a small chosen group that knows it will be charged in the future. You don’t want word of mouth spreading the rumor of free pumpkins and corn given away daily your farm. For example, if you’re planning a small-scale cooking class, or an on-farm writers’ retreat for just a few customers at a time, offer it for free to a select small group that knows it’s a practice run to generate testimonials and positive word-of-mouth. There is one flaw in the idea of letting customers have too much say in what your on-farm project will be. People are so removed from nature, they may not even know how beautiful the experience of picking their own flowers from your u-pick flower patch can be. You may choose to balance the idea of allowing others to guide your choices, but also finding ways to get them to experience on-farm activities that eventually gets them hooked on something they hadn't tried before. The above mentioned owners of Sweet Grass Dairy attracted people to their farm in the first place, and then later developed a cheese-making class when visitors to their Market Day began requesting them. When allowing customers onto your farm, be sure to set out a sheet for comments, with an option for their name and contact information. These may lead to testimonials or even new ideas for on-farm marketing. Gift baskets are value-added products some farmers are selling both direct from the farm and off. Here’s one person’s secret to marketing her gift baskets who lived close enough to a large city where she hoped to generate customers. She built a beautiful basket and carried it to a busy high rise’s elevator, as though she were delivering the basket herself to someone in the building. All afternoon, she rode up and down the elevator, handing out business cards to the people who couldn’t help being enthralled by the beautiful basket. This is how she got her first initial customers, and grew from there. While there are conventional recipes for marketing, many of which we’ve overviewed here, remember to think out of the box when it comes to generating promotion for your farm, and custom-fit it for the lifestyle you already live. Hate elevators? (So do I). Instead, do your kids belong to a scout troupe? Could the troupe and its parents have a VIP tour with a sample product and farm brochure? Do you knit? Could a knitting gathering take place on the farm? Are you involved in the local Audubon Society? Could they come to the farm for bird watching? Do your parents have an upcoming anniversary? Tony and Carol Azevedo of Double T A-Cres in California held a 500 person anniversary party for their parents on their dairy ranch. Afterwards, guests began calling to see if their own events could be held there, and since, they have earned substantial additional income from weddings and other events held on the farm. Wearing, giving away, or selling your own farm t-shirts, caps, mugs, etc. The more potential customers see the name www.MyAwesomeFarm.com, the more new customers will remember and eventually find you. Why waste trips to the grocery store or pumping gas when it can effortlessly double as a way for marketing farm products or lead people to your farm's website. Fill up those groceries with a grocery tote printed with your farm's name or website. Wear your farm's T-shirt when doing other errands around town. 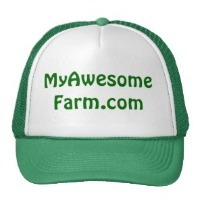 Like bumperstickers -- you may be interested in customizing a single hat, t-shirt, mug (tote, jacket) at our Zazzle affiliate to use or wear and start advertising your farm whenever you're seen anywhere. You can also do as the owner of Blue Harvest Farms did. This blueberry farmer designed an online farm merchandise store and linked it to his farm website. When you do this, customers can directly purchase your farm's t-shirts, caps, mugs, bumperstickers, or whatever you choose to customize. You choose the price and get a good portion of the sale price, while all the printing, ordering and delivery is done for you. You just check your account now and then to see how much is deposited. You can set up your own online farm store by signing up here at Zazzle. 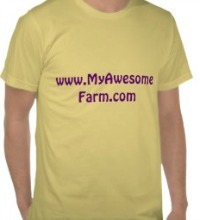 Customize your own farm's t-shirts, hoodies, tanks, sweatshirts, and more! No minimum. Customize your own farm hats (and totes, ties, posters, bumperstickers) and more! No minimum. and have it on your vehicle in a very short amount of time. You can order just one, or many. Choose font styles, background colors, and font colors. Even your own images. Just make it easy to read from a distance. No tiny white letters with light yellow backgrounds! 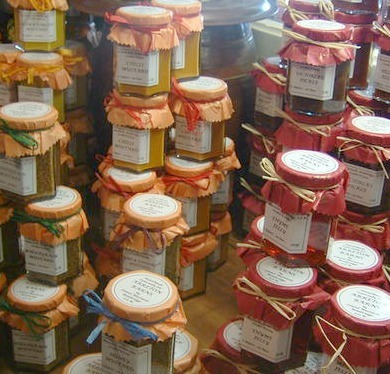 Customize beautiful labels for your farm grown food product!